Today I will show you a simple way to design your own massive turbine, generator, warp engine, type of sound from scratch using FM8. 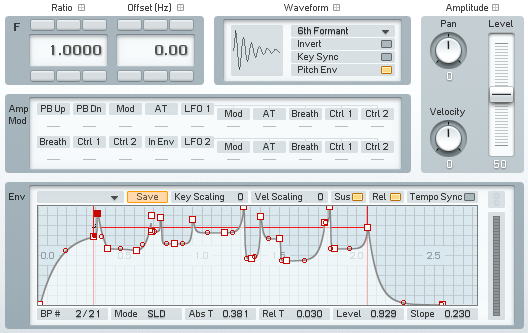 FM8 (and FM7 prior to that) has been highly regarded as a perfect synth to design all kinds of cinematic quality sound effects by artists all over the world, for many years now. This quick lesson will show you why frequency modulation synthesis is such an essential tool for sound designers specializing in film, animation, software development and even high end music endeavors. That’s right, not all musicians using this kind of effect just grab an audio sample to drop into their songs. Some of them are brilliant when it comes to finding unique and original way to incorporate intense sounds they themselves have synthesized to replicate real world noises. Sometimes this is absolutely necessary. Let’s start with the FM Matrix. A lot of the focus here is going to me on noise, and frequency modulation. So not all of our operators can be heard on their own, but rather how they affect the other sounds in play. Set up the F Operator to use a 6th Formant wavetable and to feed back into itself around 80% before routing it through both the noise filter in Operator X and the main output. Now set up both Operators D and E to feed back into themselves 15-20% and then route them through the noise filter, as well. Operator D needs to be set at a ratio of 0.0000, and the Offset value needs to be set in the neighborhood of 193.00 and is using a Soft Square wavetable. This provides some needed movement. 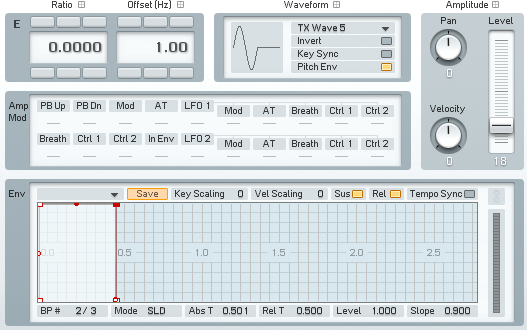 Operator E Offset value needs to be set to 1.00, and is loaded with a TX wave 5 wavetable. Now getting our noise to sound natural means having to program some envelopes creatively to give the illusion of randomness. Luckily, this sound will also have plenty of reverb and delay added later, which means that there is no need to make our envelope curves too complex or long. Operator F is our main target at this point. We only need one operator delivering these sharp changes to Operator X because it acts as a carrier, as do Operators D and E. Operator D is a long building attack, while Operator E is very short and abrupt. There are a total of five effects used to make this sound come together. First, I added a Chief V-30 Cabinet. Then a Phaser is inserted. Add a big Reverb and the Psyche/Delay to really stretch this sound out. Lastly a Chorus/Delay effect is added to give a little more movement at the end of the sound chain. The last place to visit is the Master window. 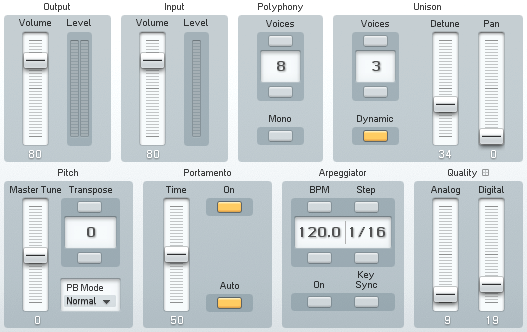 Here I turned up the Unison Voices to 3, and increased the Detune and Digital parameters. The rest of the manipulation is done through automation. It is up to you how you go about doing it, but the important thing is to modulate the pitch parameter so it slowly raises over time. In this example I have chosen to us the Pitch knob on the Psyche/Delay effect, just show that you can indeed automate anything you like within FM8. You just need to draw in the curve in your DAW to the smoothest result. Since this particular pitch control is set up to toggle through whole pitch values at a time, it gives that sense that our engine is clicking through different gears as it winds up to its maximum potential. The audio sample below is our sound in action. 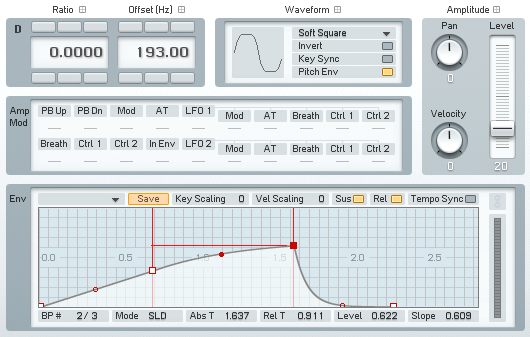 No processing has taken place outside of FM8, though there is one automation curve drawn in to control the pitch modulation. I stretched it out over a period of about a minute to give you the opportunity to hear all the different phases. I chose to have a slightly musical element to it because I intend for it to be used for both film scoring and music production, so this way I can use the patch for both and only make a small tweak either way to make it fit. I hope you enjoyed this FM8 tutorial. If you have a request for future posts or if you want to share one of your own walkthroughs with the rest of the community, please send us a message and let us know. Thanks for stopping by!